Cost-effective due to optimised rolling resistance. Short braking distances, even on wet surfaces. Trusted by leading car manufacturers; Mercedes-Benz Viano/Vito, Renault Master and VW T5 come equipped with Vanco Eco from the factory. 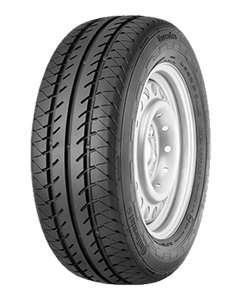 Reduced fuel consumption and lower rolling resistance are the hallmarks of the new Continental VancoEco tyre for light commercial vehicles. Specially developed for vans such as the Mercedes Viano, Vito and Sprinter, Ford Transit and Volkswagen T5, Continental’s VancoEco boasts up to 30% less rolling resistance and a calculated four percent saving in fuel and emissions, than standard versions. At the same time engineers have managed to cut the braking distances on both wet and dry road surfaces making the tyre more car-like in its performance. The great savings potential has been made possible by two design measures that together help reduce rolling resistance considerably. VancoEco features a new silica tread compound optimised for low rolling resistance. In addition, the tread design has been changed so that deformation, which all tyres are subjected to when the tread elements make contact with the road surface, is reduced considerably. The two measures combined with a shallow tyre contour allow up to 30 percent less rolling resistance equates to a four per cent reduction in fuel consumption. With VancoEco, Continental’s engineers have managed to achieve low rolling resistance without compromising on the inherent safety features present in all its tyres. In addition to helping lower fuel consumption the VancoEco tread pattern is designed in such a way that it forms small gripping edges during braking. This helps to reduce braking distances dramatically on wet road surfaces or when vans are fully loaded. Tracey Hyem, Brand Manager Continental Tyres UK commented: "With the new Continental VancoEco we estimate that drivers can reduce their fuel consumption by around four percent with a regular, controlled driving style. In addition to this, the VancoEco range features a solid belt tread, which transfers steering commands precisely giving the driver total confidence in wet driving conditions or when the vehicle is fully loaded." The VancoEco range is currently available in 15" and 16" rim sizes in sizes to fit the Mercedes Vito and Viano and the Ford Transit. Further sizes will follow in 16" and 17" in 2011 to fit the Mercedes Sprinter, Volkswagen T5 and Renault Master vans. Sorry, we currently do not have any tyres with the Vanco Eco pattern in stock.